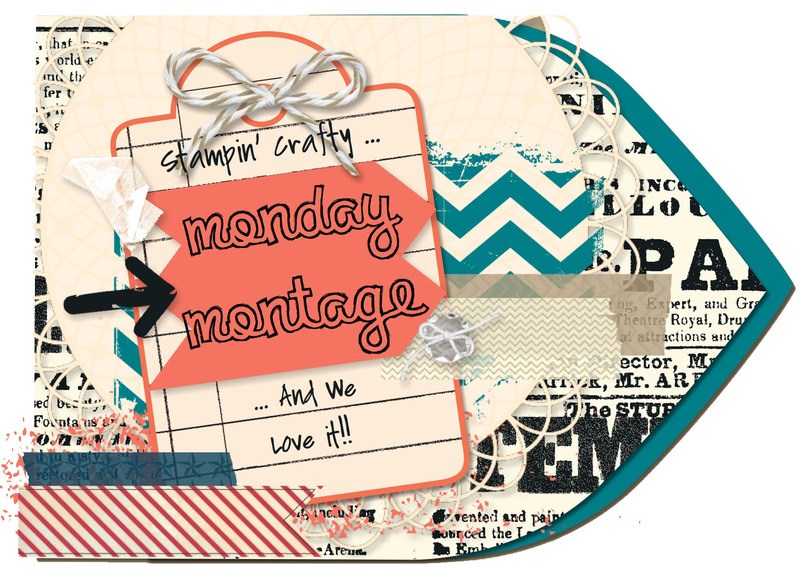 We’re back with another Monday Montage blog hop for you tonight. There are ten of us participating, and you can easily make your way through the hop by clicking on the “Next” or “Back” buttons at the bottom of each post. 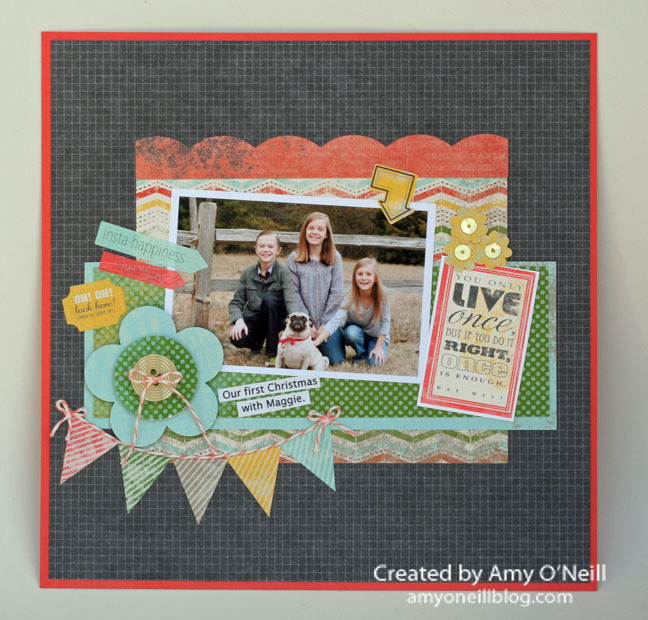 I have an 8″x8″ scrapbook page to share with you this time. Some of you may remember that when I was at Convention last summer, my family adopted a dog while I was gone. I came back to find an adorable two-year old Pug named Maggie. Well, Maggie is a full-fledged member of the family now, and I have loved to see how she has bonded with each of us, especially my nine-year old daughter who paid for the adoption and feeds Maggie every day. Maggie runs upstairs and waits patiently outside Kendall’s door each morning until Kendall wakes up, and then gives Kendall an excited greeting. And Kendall always makes time to love her dog back. Before Christmas, I was taking some shots of the kids for Christmas cards and of course, Maggie had to be included. I decided I needed to make a scrapbook page to remember our first real photo shoot with Maggie. 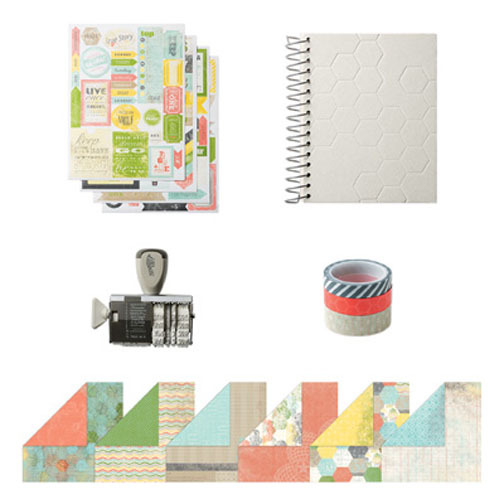 I went back to an old favorite, the Epic Day This and That suite of products for my layout. I also used one sheet of the Kaleidoscope dsp (the Basic Gray graph paper background sheet). There are some really fun Epic Day This and That Designer Stickers that coordinate with the dsp, and I used several of them on this layout. It makes for a quick and easy page. 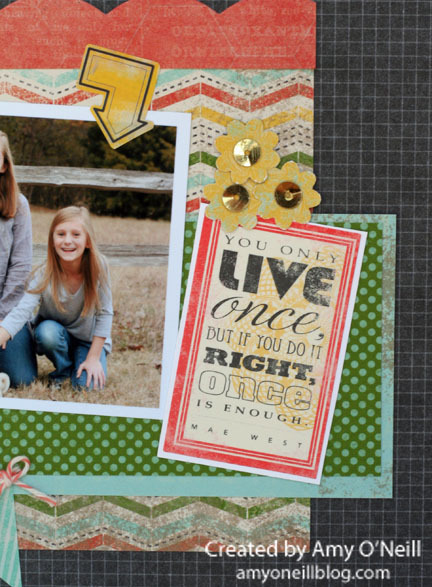 I love scrapbooking, and I really should do it more. It is what first drew me into this papercrafting hobby. And my kids love looking back through pages like this. This page will actually be going up on a bulletin board in our home office/craft room for a while. 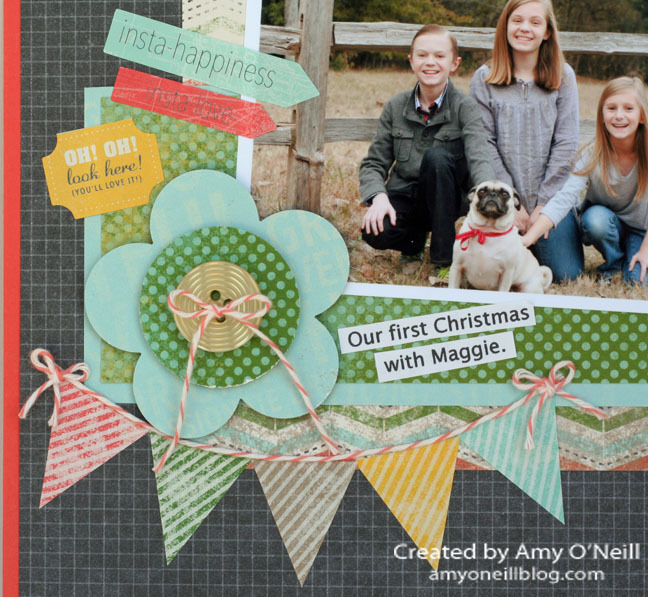 You’re ready to hop on over to Breelin Renwick’s blog and check out her amazing creation. If you’d rather work your way backwards, you’re welcome to hop on over to Wendy Weixler’s blog and see some of her awesome-sauce work. Either way, be sure to make your way through the other nine posts. Enjoy your Sunday evening! Thanks for stopping by! This is a card with some of my favorite things — chevrons, doilies, washi tape, and butterflies. Plus, it has some of my most favorite colors. Ahhh….happiness. I tell ya, this washi tape is fun! And so easy! I love that if you don’t get it right where you want it, you can easily lift is back up and reposition it. This was a super simple card. I must say that I don’t understand why the Color Spritzer Tool is being retired. It’s probably my favorite tool! I will definitely be hanging onto mine. Ok, I was really good last week! I didn’t use any of the This and That Epic Day products for the whole week. But it’s a new week, and I love this stuff. 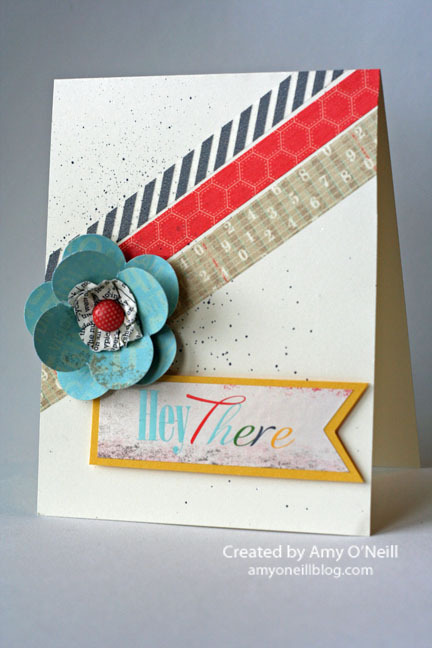 I was totally inspired by this card made by Laurie at Soapbox Creations. 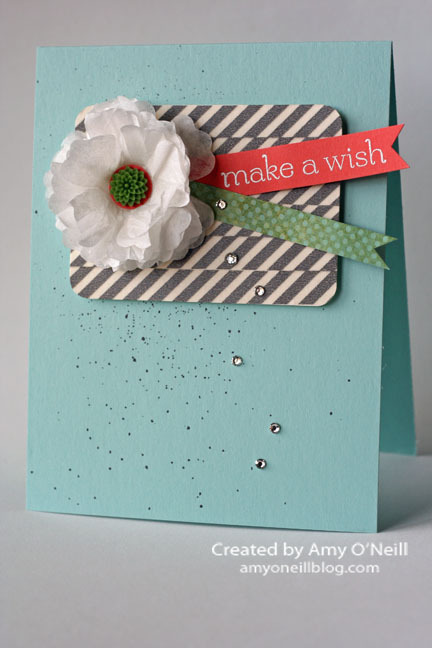 I think she is so talented at making clean and simple cards that are so striking. I used my diagonal plate for the Simply Scored tool to make the diagonal lines on the Basic Gray card stock. The stamp is from My Paper Pumpkin’s intro kit. I was recently asked to be a guest blogger at the Pink Paper Bakery. 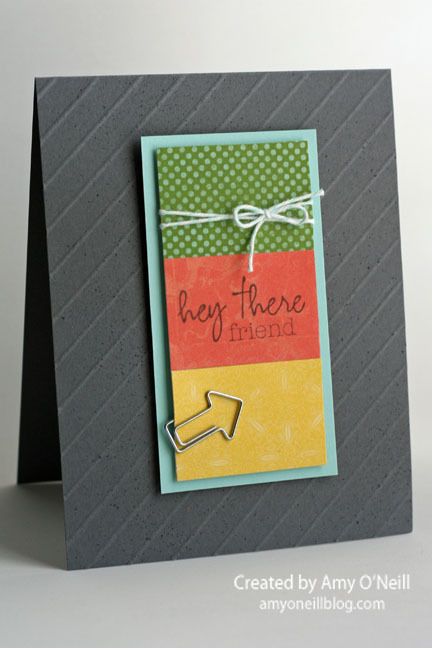 I thought I’d share a new product that Stampin’ Up! just started offering — washi tape! I was so excited when I saw that this would be included with the new This & That product offering. As soon as I received my package on Friday, I was already thinking of how I wanted to use it. I made a couple of cards with it, that I’ll share with you today. On this first card, I also used the Epic Day dsp and the Epic Day Designer Stickers. I love how everything in this bundle coordinates with each other. I then put some adhesive on the flower petal next to the cut, and placed the other flower petal on top of it, making it a four petal flower. 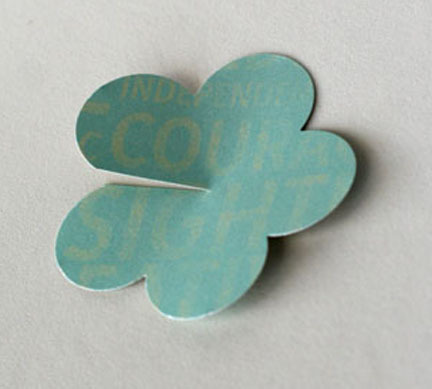 I punched another flower using the newsprint paper, and scrunched it up and stuck a brad in the middle. I placed one of the stickers from the Epic Day Designer Sticker pack on some Daffodil Delight card stock and cut it out and adhered it to the card base with dimensionals. For the second card, I made a panel of Very Vanilla card stock and applied Washi tape over the panel. I then made a flower using the Blossom punch and Creped Filter Paper. I spritzed the card base with a Basic Gray marker again, and then adhered my washi tape panel with the flower and banners. I added some rhinestones for added interest. I can’t wait to play with this washi tape some more! It is so easy to use and it’s so fun. Right now, you can get the This and That bundle at 15% off. The product number is 133350 and the bundle price is $32.08 (US dollars).